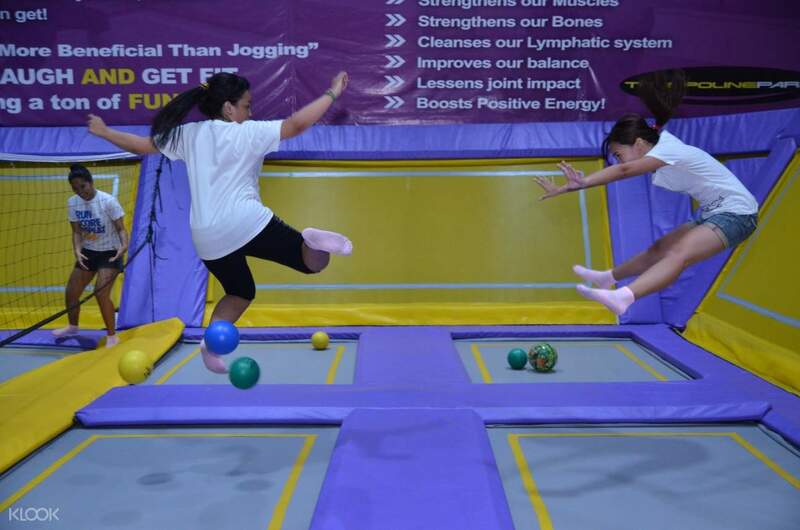 The park is your playground as you jump on the 60 interconnected trampolines on the floor and walls! Come enjoy and fly with us in the best Trampoline Park in the country! It was an amazing experience, all ages will enjoy their stay here. My boyfriend and I, celebrated Valentine's day here, it wasn't crowded with couples like other places, however just expect that there are tons of kids there playing around. Overall it was a fun experience even if I got really dizzy. 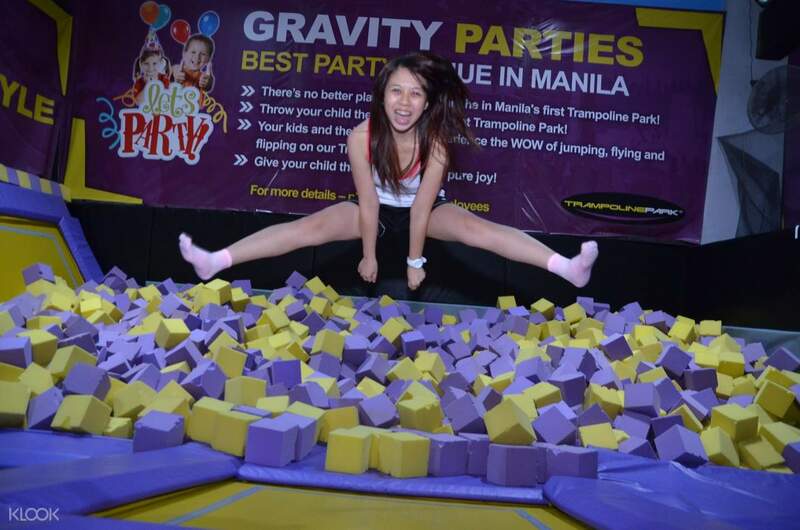 Level up your Manila experience with an intense trampoline session at Trampoline Park! Nestled between the hustle and bustle of the metropolitan, the team behind Trampoline Park cooked up a unique addition to the city's flourishing lifestyle and leisure activities: a play area solely for trampoline exercises perfect for all ages. Dive, jump, fly, and break new grounds as you take on intensive fitness challenges available on site! Better yet, why don't you dare your friends on landing the highest, coolest, and smoothest Slam Dunk this century has ever seen and snap your dramatic fall into a thousand of foam cubes. Book up to 2-hour trampoline sessions on a weekday or weekend and prepare for a liberating, energetic, and amazing family fun right in the center of the jet-setting cosmo! 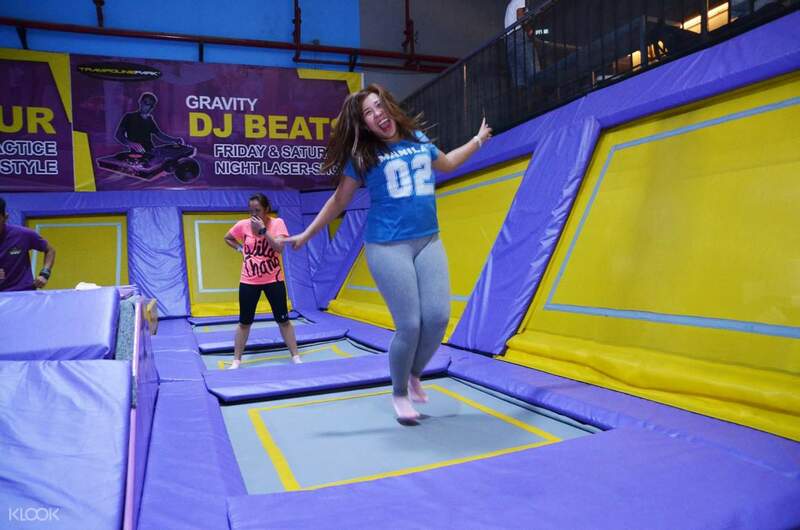 Jump or fly around the trampoline-filled paradise at Trampoline Park Philippines! It was an amazing experience, all ages will enjoy their stay here. My boyfriend and I, celebrated Valentine's day here, it wasn't crowded with couples like other places, however just expect that there are tons of kids there playing around. Overall it was a fun experience even if I got really dizzy. It was an amazing experience, all ages will enjoy their stay here. My boyfriend and I, celebrated Valentine's day here, it wasn't crowded with couples like other places, however just expect that there are tons of kids there playing around. Overall it was a fun experience even if I got really dizzy. This place is a good workout for anyone...it is spacious, cool, clean, and you can play basketball, roll around in those bubble things, play volleyball, or just jump around till your happy hormones overflow! It's also conveniently located in the Greenfield District where there are lots of new restaurants t check out after all that jumping and laughing. This place is a good workout for anyone...it is spacious, cool, clean, and you can play basketball, roll around in those bubble things, play volleyball, or just jump around till your happy hormones overflow! It's also conveniently located in the Greenfield District where there are lots of new restaurants t check out after all that jumping and laughing. We had so much fun! It was great experience. Worth it that price for 2hrs with discount of Klook redeemable points. Thanks u so much Klook for the no hazzle booking.. We had so much fun! It was great experience. Worth it that price for 2hrs with discount of Klook redeemable points. Thanks u so much Klook for the no hazzle booking..
We had so much fun! For first timers 1 hour is enough para mapagod ka😂😂😂 the place is big and there are many instractors. We had so much fun! For first timers 1 hour is enough para mapagod ka😂😂😂 the place is big and there are many instractors. the kids enjoyed the trampoline park. they were first asked to stretch in order for muscles to be prepared to all the jumping and bouncing. It was a lot of fun. the kids enjoyed the trampoline park. they were first asked to stretch in order for muscles to be prepared to all the jumping and bouncing. It was a lot of fun. The experience here was fun and tiring. good photo time. Would love to try it again soon! The experience here was fun and tiring. good photo time. Would love to try it again soon! Nice experience! My kids enjoyed the park! Will definitely go back with friends and family! Will use klook again! Nice experience! My kids enjoyed the park! Will definitely go back with friends and family! Will use klook again!